You may not consciously believe in the flying spaghetti monster, but if you affirm Multiverse Theory–as many atheists, agnostics, and anti-theists do–then you really do believe in his Meatball Noodliness. Here’s how. 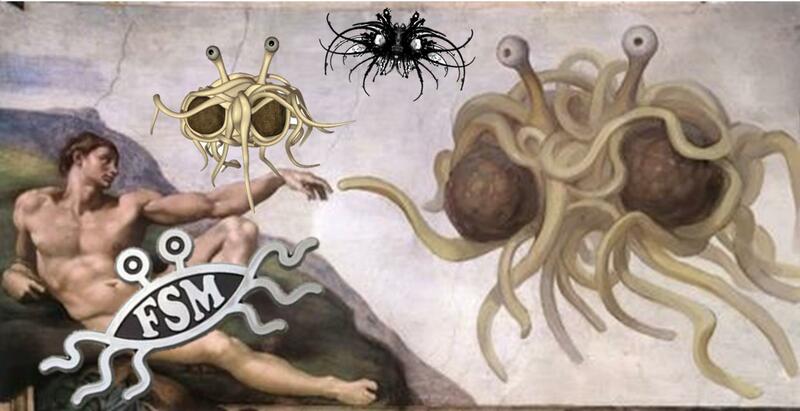 Premise 3: The Flying Spaghetti Monster is logical possible [as are unicorns, leprechauns, tooth fairies, etc.] since they are not logically incoherent. Conclusion: Therefore, the Flying Spaghetti Monster exists. There you have it. If one agrees with multiverse theory, where the number of universes are so vastly expanded as to make inevitiabilities out of the many improbabilities of this universe, it is virtually certain that at least one of those many universes has a flying spaghetti monster. For that matter, one may add to the collection of actualized creatures, unicorns, fairy god mothers, tooth fairies, leprechauns, and honest lawyers. All of these exist!!! Yes, it would exist if both multiverse theory is true and it is logically possible. But neither have been established. We don’t know much about FSM, he may indeed be logically impossible in any universe. Multiverse theory does not allow for magic. It doesn’t allow for a universe with physical laws which are broken within that universe. I agree that neither have been established. As for FSM, it should be remembered that many of our physical laws are not strictly necessary metaphysically. Physical possibilities are radically expanded to the brink of metaphysical coherence. To your point, this means magic IS possible so long as it’s not metaphysically incoherent. There could be universes where astrological formulations generate physical changes in the lives of mortals, since that universe may have physical laws that our universe doesn’t. A person’s personality or health status could be registered on his/her hands, thus enabling palmistry (palm reading). In that sense, multiverse not only allows for magic, it makes magic inevitable. We might, however, need to define what you mean by “magic.” I take it to be some occult causal force which is neither mechanical nor by personal (i.e., intelligent). Another universe could have some preternatural force like panpsychism which is neither personal nor physical. Or it could have physical laws which are so erratic that there is no principle of uniformity to guide any sort of “science” and magic is just as helpful a descriptor as anything else. To your point of “physical laws not being broken within a universe,” I think your right, but only trivially. Even if Jesus Christ bodily rose from the dead by the direction of Father God, that would not “break” any physical laws because our physical laws describe natural operations in a closed system. They do not describe events within an open system. One cannot break a rule where no such rule applies. I think you are misconstruing the theory. For a FSM to exist in a parallel universe, the physics of that universe would have to allow for it. That is my take anyway. Of course the physics of that universe would have to allow for it. But lets remember that a key motivating factor (though not the only factor) behind Multiverse theory is its potential for explaining the seeming “intelligent design” of this universe without having to surrender ID (that is, saying “it’s just luck” is hardly scientific, and makes ID look pretty scientific by comparison). Multiverse has to radically expand the the realized possibilities so that the improbabilities of this universe become inevitabilities. In essence, multiverse must “play the lottery” many many times so that the incidence of “winning” the lottery (of biology) in this world needs not appeal to merely blind luck–i.e., can give a scientific explanation rather than a shrugging shoulder. The theoretical possibility that the physical laws of this universe are CONTINGENT is precisely why multiverse theory can do what it does, postulating near-limitless variations on the physical laws so that every remote possibility becomes an eventuality; even the FSM. You are mixing up your apologetics. M-theory is not properly raised as counter to ID in general, but to the so-called fine tuning argument, a sub set. This argument submits that because a number of constants used in physics are so incredibly specific, they must have been specified by a mind. This is an argument from ignorance. The specificity of these constants implies three possibilities, they are random (luck), necessary, or chosen by a mind. M-theory is one way in which they would be necessary. There may be others, we don’t know the likelihood of them being established by chance, M-theory, or design. The conclusion that it is more likely design is unjustified, not to mention that it just pushes the problem back a step, how likely is it that such a mind exists by chance, and so on. The diversity we see in biology and material abiogenesis is not at all unlikely compared to the constants above, or the existence of supernatural entities. I’m also not sure that accounting for the specificity of cosmological constants was much of a motivating force in the development of M-theory. It seems to be just part physics and math. But I digress. The fine tuning argument IS a facet of ID. ID has several domains including irreducible complexity, specified complexity, fine tuning, mind, and perhaps a few others. Jay Richards’ book “Privileged Planet” is a keystone of the ID movement at the Discovery Institute. Meanwhile, the fine tuning argument does not simply submit “specificity” (as you call it). Rather, the argument is that the various features of the universe, be they specified, complex, or irreducibly basic, or some combination of these, are identical or analogous to the kinds of things we KNOW minds can produce but which we do NOT know anything else to be able to produce. Thus we have prima facia probability lent to the design thesis. It’s a beast trying to clarify how much of a “probability-bump” that lends. But it’s normal science to allow simply THAT there is an initial probability gain wherever we have a known sufficient cause, i.e., mind; even if it’s only analogous (i.e., supra-universal mind analogous to human mind); after all, most every scientific conclusion is analogous (for example, we might conclude that other points and times where Xenon exists, it will operate as it did in this experiment where some sample of Xenon did Y in chemical Z). Meanwhile, your treatment of the Fine Tuning argument seems like you’ve read more about it from Krauss and other skeptics than from actual advocates of it. As for “pushing the problem back a step” you’ll have to show me why I should posit a contingent being at back of this present universe. You seem to be assuming that the initial cause of the universe would also be an effect some prior cause. I’m willing to grant that there is either an eternal nature or an eternal supernature, but I’m not willing to grant, on pain of logical coherence, that there is an infinite series of contingent prior causes. There might be some finite series, say, 13 prior universes before the first cause, But if God caused it, then it’s silly to ask what caused the uncaused first cause. If this cosmos looked to be the kind of thing that goes on forever, and is not “winding down” then it might be a sufficient explanation for itself (maybe). But since we’ve known ever since E=MC2, and earlier, that the universe as we know it is a contingent thing, and does not seem to be a sufficient explanation of itself. All else being equal, M-theory and Theism are then possible answers, where steady-state is not. Since one posits a personal mind, and the other does not, and the features of the universe are well suited to the act of a mind, and not known to be suited to the acts of unguided chance, the ID thesis is therefore the initial favorite. Stated more strongly, earth biology is of such a specified-complexity, irreducible complexity, and dependent on such finely tuned features where innumerable contingencies could have undermined it all, one cannot responsibly appeal to sheer “necessity” or “luck” and think that a “scientific” explanation. That might be an interesting “faith” claim, or a religious position (say, in stoicism or jainism), but luck is not science. And no sufficient “necessity” has been demonstrated to provide even an analogous explanation for things so that “necessity” is a strong scientific explanation. But M-theory if proven would make the the specificity of these constants a necessity in one universe. You’re right, it hasn’t been proven, but neither has design. But we have no way of knowing which is more probable. To determine prior probability we would need observation of cosmos creations to judge by. Even if design were the case, it need not be supernatural. Being in a simulation would be more likely. Our universe could be a simulation from a universe lacking such specificity of cosmological constants. Sure, it would be probabilistically inevitable, but not metaphysically necessary for any particular universe, including this one. Can you elaborate your simulation theory? It sounds like you are blurring possibility and probability. I’ve got no reason, or at least no probable reason to think that this world is a simulation, and of course if it were a simulation that would be impossible to know as such. Entertaining that idea is sophistry. To be fair, a purely naturalistic account is theoretically possible, and logically coherent. Metaphysically we don’t have an analogue where non-intelligence has, by efficient causality, made intelligent life. I cannot safely attribute any initial probability to that theory. It’s a testable hypothesis, but it’s turned up empty regarding all strong confirmations–i.e., life coming from non-life; complex informational sequences originating purely by known natural forces, etc. So stretching that account all the way back and wide enough to encompass the entire history of the universe does not necessarily make the origin of life more probable on naturalism; instead, that widened scope exponentionally increases the likelihood of chaotic outcomes given entropy, reducing the likelihood of complex informational systems such as required in biological life. ALL our known examples of engineered life have come from prior life; all our computer simulations are known to have come from minds; the kinds of information we are finding in even the most basic living organisms are proving to be ridiculously elaborate, and we have no known account–or at least no widescale concensus or demonstration how natural forces can account for it. To think that life can come from non-life requires a leap of faith that tests credulity. By analogy (at least), it would require an utterly unique alignment of contingencies and (perhaps) naturally necessary laws such that this planet could even be able to support life. We lack any analogy whereby we can attribute metaphysical plausibility to that thesis. We know that minds can adjust dozens and dozens of environmental factors to make life more possible; we do not know that non-minds can do such a thing. Even if you had an example for me, I doubt you have enough examples from purely natural causes to be able to outnumber the numerous cases of intelligently designed systems “planning” for life. If I were positing a mind that is WHOLLY unlike human minds, then your point would be valid. But I’m extending an analogical argument only as far as analogy can go. There is a mind, bearing some semblance to human intelligence, that would have to be at back of this universe for life to have emerged in the sorts that we’ve seen in the world. Correct, but we aren’t talking about the “fact” of the cosmological constants as you suggest we are might talk about the fact of yesterday. We are talking about their origin. We do not know how they were arrived at. We simply do not know the prior probability of any of the three possible causes. It may be one in several billion trillion, or it may be one in one. We would need to know how they were arrived at first. If it was multiple universes it is one in one. Anyway this horse was long dead before we began beating it again. You are right, however, that we do not have observed cases of “cosmos-orginating” events. But I don’t think that’s necessary since we often infer, by scientific methodology, about unique events. Heck, yesterday only happened once in the history of the world but it doesn’t have to be repeated for me to know it occurred. I think you are demanding an unusually high standard of testing which is not internally consistent with much of known science. Regarding the role of analogy in science, a scientist would be perfectly justified in supposing that there is life on mars if if there were a moving rock on Mars which emits information carrying sounds, and changes colors according to the emotions of whoever is closest to them. We have no such thing on earth that does that, at least, not any natural life. But since we have things like “sympathy/empathy,” “language,” and “self-motion” on earth we can infer, by analogy, that that singing rock is possibly alive. We could then begin to test that thesis according to other things we know about intelligent life on earth, including dialogue, judgment, self-awareness, etc. If the rock pass those tests too, we could rightly deem it a new kind of life. Yet, we would not have to have other identical kinds of life before we can know that that rock is alive. Brian, you are assuming there is a “one in . . . ” for each of the 3 scenarios. Luck is not a scientific option, so that even if it were correct, we’d still need a deeper causal account to access the “how” and maybe even the “why” behind things. We can strike that one out, it could be a 1 in 2 chance, but it’s not what we are looking for in our origins account. We are looking for natural or supernatural causes, not descriptions which gloss over the actual causal factors. You suggest there is a starting probability of natural causes behind the origin and organization of the universe. Since that event only happens once, as far as we know, we can only access it by analogies. Since you offer no analogies relevantly similar to a non-intelligent natural origin of the universe, our initial probability is not a “one in [some number],” there’s no “one” to begin with. It’s initial probability, at least in terms of observational science, is nil. You have to step back into theoretical philosophical realms to deal in the logical possibility of non-intelligent forces generating a universe that lies pretty well outside the testibility-criterion of the hard sciences. I know, I know, that’s called theoretical physics and it’s still a branch of science, but it also overlaps the most with philosophy, and since you are demanding “hard” evidence, it’s only fair to offer some hard evidence in return. On the other side of things, what “hard” evidence can I offer? Well, observational types of experiments can easily show how minds can finely tune factors to make hospitable environments for animals, or to generate non-biological but still intentional outcomes. We have literally billions of examples providing support for the plausibility of design thesis. You may disagree at some point and say, “But people are evolved over many years from non-intelligent, non-living materials.” That’s an interesting idea, but having no demonstrations that life comes from non-life, we don’t have the strongest “science” to back up that idea. We lack even one good example (i.e., no “One in [some number]”). Meanwhile, we have very strong observation-based, repeatable science that shows that human minds can conduct goal-oriented tasks, with many careful steps, where even a slight error would ruin it. We know that no human mind created the universe, but we DON’T know that human minds are the only minds out there. Whatever triggered the big bang should be aking to human minds, but way larger in scope. We can further support or discredit this idea by testing its antitheses. We can keep trying to generate life from non-life. We can keep running experiments in randomness to see if complex information systems and the signs of information arise naturally. We can keep checking the numbers on multi-verse theories, and Hawking’s theory/s. We can keep trying to understand human minds, we can search the animal kingdom for evidence of higher-order life. We can keep looking for intelligent life, or any life, on other planets. We can also evaluate the fine tuning argument through testing its internal coherence. In terms of productivity (one of the other tests for “science” status), we’ve already outlined dozens of features that are necessary for higher order life. And we can use these features to filter out planets in the massive task of astro-biology. The fine-tuning thesis has led to a much better understanding of the variegated contingency of our delicate biosphere; very useful for environmentalism and various green causes. Wow. To suggest that this universe is somehow tuned for life is preposterous. The vast majority of this universe is utterly uninhabitable, most of this planet is deadly to humans. Even where we can live, we are surrounded by peril, death, disease, and suffering. Think about what you are suggesting. A mind creates the incredibly vast universe and allowed life to grow on the crust of one small planet, and even there waited 9 billion years for it to happen? What, he fine tuned it so no life would be possible until enough large stars created more heavy elements and exploded in supernovae which then had to congeal into planets around other stars and water has to get there from comets maybe. THEN God magics this stuff into life? This is the perfect design of the almighty? I mean a purpose driven universe would have been the one the ancients believed in when they wrote the Bible. The earth is the centre of the universe. There are no natural laws or physics, everything is sustained by God. Everything moves and exists by his Grace. We are perfect souls corrupted by and into flesh by our on sin. There is no vast realm of solar systems, no other galaxies with countless other worlds. No quasars, with the power of 200 thousand stars burning 3 billion years ago. There is no evolution, why should there be? We are not directly related to other primates or mammals and so on. THAT would be a universe created for life. To misquote Carl Sagan, even if we’re not all alone out here it still seems like a waste of space. I mean even if current speculation of extra-solar habitable zone planets is accurate, and the creator created life on ALL of these, we are still dealing with a tiny tiny fraction of the universe containing life. The vast majority being dark matter and more or less empty space, utterly incompatible with what we know as life. We simply don’t know what “sparked” the Big Bang, if anything. These cosmological, and teleological arguments always break down to special pleading and ignorance. I understand that just seems unthinkable to some that there not be a mind that designed before there was time, but we do not have the evidence to support such inferences. We just do not know. So we both agree that most of the universe is uninhabitable. And . . . ? Since the uninhabitable universe is what we can expect given natural laws, and every theist I know affirms natural laws, that’s not a particularly interesting observation. Design theory comports just fine with that fact since that’s not the anomaly in need of explanation. The fact of messes doesn’t disprove order elsewhere. Or calculating other equations to equal “5” does not in any way challenge the fact that, this equation of 2+2, indeed equals 4. Pointing to the non-biological universe amounts to a red herring, Life is what needs explaining. On Design Theory one can fully expect that everywhere that an intelligence is not acting/intervening one can expect natural forces to provide a sufficient account of the chaos, entropy, inertia, etc. happening out there. Given your rebuttals, I wonder what you think Intelligent Design is? By the way, I don’t believe in magic. I don’t know if you do, but I believe in two broad kinds of moving/efficient causes–mechanical and intelligent causes. That’s it. I don’t believe in magical forces. I’d be interested in hearing your defense of what a “purpose driven universe” would look like. I suggest you have overstated your case. I offer a teleological account, yet I don’t think Scripture, or a “purpose driven universe” requires what you say it does. It sounds like you are critiquing the “God of Atheism” and not the “God of Theism.” That is, you are attacking God-as-characterized by atheists. And that risks the straw man fallacy. Your description certainly doesn’t describe my theism, and I’m pretty down-the-line orthodox. Supernaturalism, and ID theory with it (they aren’t the same) allow for all the natural causes, embracing all of naturalism AND still allows for another cause (intelligence) besides nature and mechanicism. Christian theism encourages and affirms the discovery of the natural universe (the Wisdom books); it predicts a highly ordered, but imperfect world; as in, faded beauty or fallen finery (i.e., the doctrine of the Fall). It allows for God to establish orderly patterns and subordinate rules and laws, as well as creating creators themselves (human beings; Gen. 1-2; Job 38-41), And it iterates emphatically that there are operations at work which make our simplistic hedonism (pleasure-ethics) and selfishness (egoism) look like mud pies (naturalism) when we could have had a vacation free at sea.The biblical God is decidedly darker, stranger, and more complicated than the “simple theism” that many atheists seem to assume would have to exist for Christianity to be vindicated. Sorry, I mistook your comments above as indicating that you inferred from the nature of the universe that it was designed for the purpose of hosting humanity. While I do believe that. This blog post wasn’t meant to say that. ← Music helps me feel.